I’ve been playing around with the new Opera Mini browser for iPhone and iPad lately. It’s fun. Some features make it stand out in the crowd. 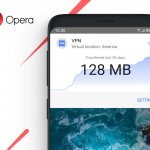 Here are my favorite Opera Mini tips and tricks that you might find helpful. pick “search”. This is a really nice feature that is growing on me because being able to search within the article you read is unique to Opera. This makes searching faster. 2) Fast scroll on pages – Scrolling has become super fast! 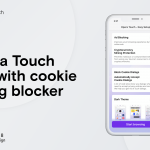 With a single swipe you’ll be able to scroll pages faster than other mobile browsers. Navigation on long pages is a lot easier. 3) Switch search engine – this is pretty cool. Opera Mini allows you to pick which search engine to use. The default one is Google. But you can change this to direct search in Wikipedia, eBay, Dictionary.com, iMDb or Amazon. No need for detours while making a search. Much smarter. Get it for free: Download Opera Mini for iPhone and iPad. 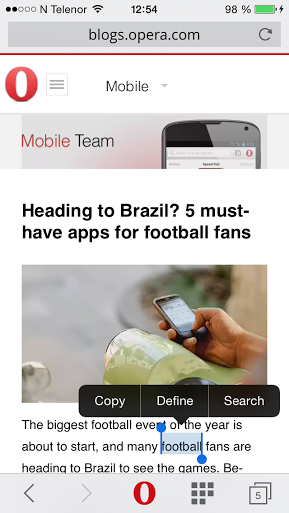 See the video: New Opera Mini for iPhone and iPad. 4) QR code functions – For those of us that still use QR codes, this is a cool feature. Opera Mini comes with a built-in QR-code reader with sharing functionality. Imagine how easy it will be to share a link with someone who’s not your contact. Geeky, but cool. 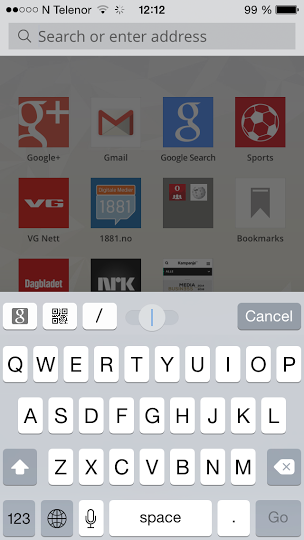 5) Virtual Joystick – Have you tried to edit a link in the tiny address field of an iPhone? You must have tiny fingers to be able to touch it. But not anymore. In new Opera Mini, we have something called a virtual joystick. The special slider control that allows moving cursor around the address field. the “pull to search” functionality (only available for iPhone and iPod touch). While you are on the Speed Dial panel just swipe down and the cursor magically flies into the address field – which means that you never needs to click on the url field again. There are many more exciting features in Opera Mini. What’s your favorite?